One of the response of British to the events of 1857 was to try and better categorize the people they ruled. They went around with their cameras and shot all kind of natives, all tribes, castes, races, religions, belonging to places all across the length and breadth of this land and put them in books and added neatly brief captions to these photographs describing in brief the 'must remember' of each native type. All this in hope that it would help them govern these people and more importantly the land better. One of the gigantic product of such an exercise was the eight volume series titled 'The People of India' published between 1868 and 1875. It's a pretty plain book, a book of colonial pen. But it is a picture book. And a picture book is always interesting. Interestingly, there are essentially two type of tribals captured in this famous colonial work: those natives that were still tied to their heathen faith, all looking, well, tribal, and those that had crossed over to Christ, looking like they have just had a fresh scrubbing and headed straight for their study desk. 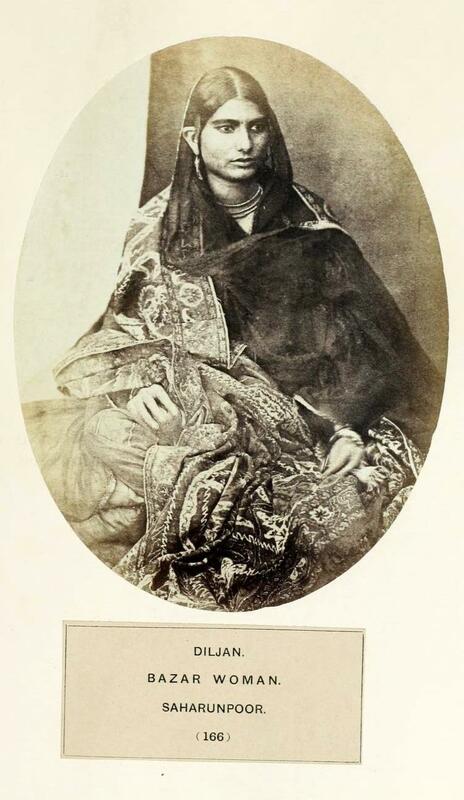 Anyway, from various volumes of 'The people of India : a series of photographic illustrations, with descriptive letterpress, of the races and tribes of Hindustan' (1868) by John William Kaye, Meadows Taylor, J. Forbes Watson, here are photographs of some of the Kashmiris that one could come across in India back then. 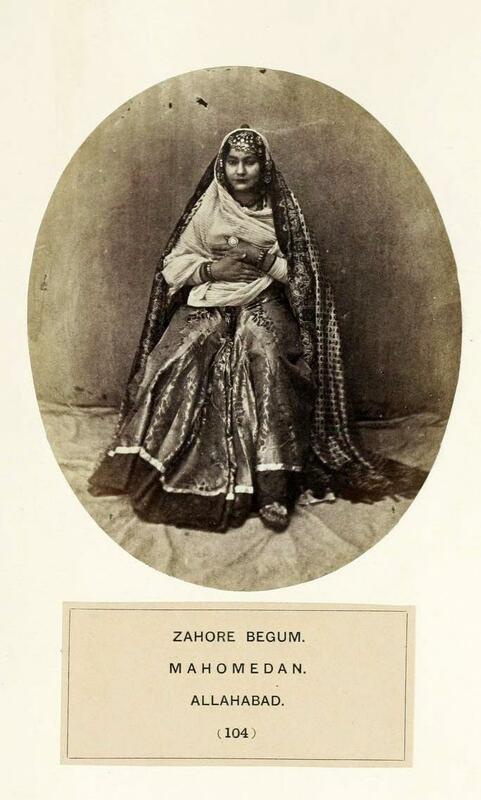 "Zahore Begum is a Cashmere Mussulmani, and follows the profession of a courtezan. As may be supposed, her charecter is not very respectable. She belongs to the Soonee sect of Mussulmans. She has a very fair complexion, black hair and eyes; she wears a black silk dress and yellow shawl; a diamond ring on her left thumb, cloth shoes, embroidered with gold and set with precious stones, and her silver anklets have small bells attached to them." 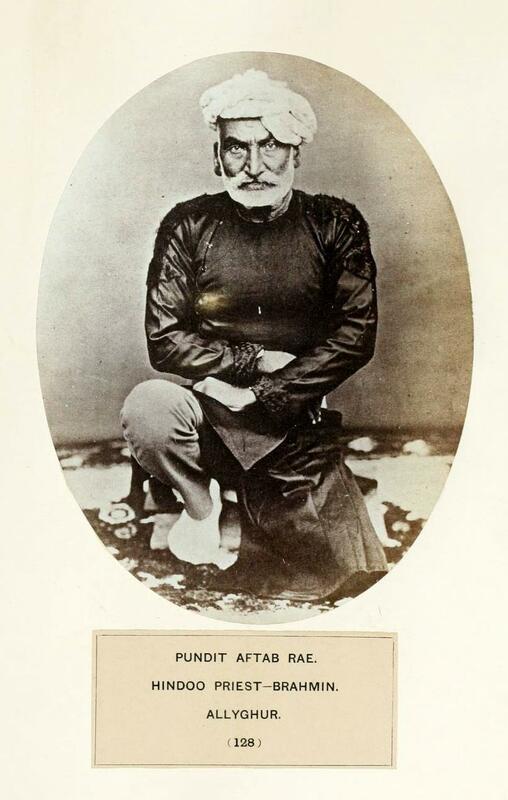 Pandit Aftab Rae. Hindoo Priest - Brahmin. Allyghur. "Aftab Rae, like Ramnarain, is a Pundit, or expounder of the Hindoo scared books. 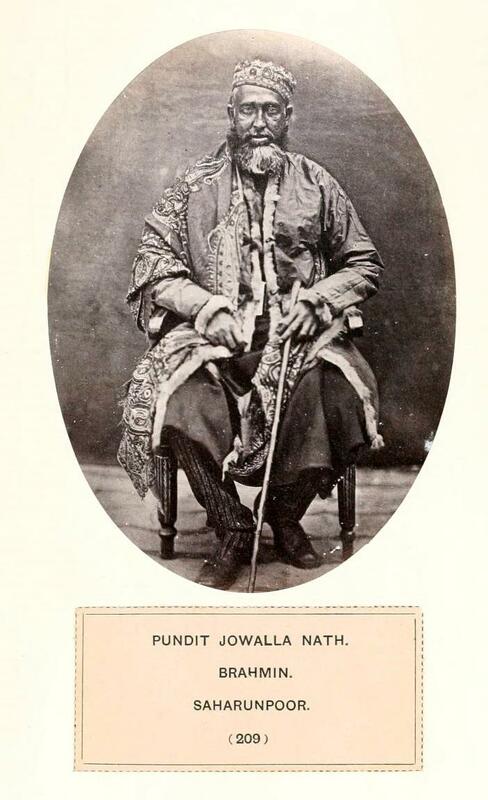 He is a Brahmin of Cashmerian origin, but his family have lived at Lucknow for more than a century. He has himself resided in Allyghur and the neighbouring districts for nearly fifty years. Persons of this class are rarely to be met with in this part of Hindoostan. They are for the most part shrewd, clever, and designing. Their habits are migratory, generally seeking employment in the civil department under Government. They go any distance to obtain it. They are Brahmins by caste, and a keen-eyed, crafty race. Their food is mutton, fish, vegetables, and grain, but not beef; and they generally live to the age of seventy or eighty years. 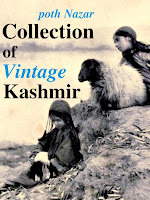 Aftab Rae is seventy years of age; his height is five feet six inches, complexion fair, hair and eyes grey." Pundit Jowalla Nath. Brahmin. Saharunpoor. "The gentleman here represented is a fine specimen of his class, a secular Brahmin, in the service of Government. Well educated and liberal in their ideas, they are for the most part above the narrpw-minded and exclusive sectarianism of Brahmins of religious or priestly profession, and prove most intelligent and valuable public officers. The Pundit is, or was, tehsildar, or collector of revenue of the Roorkee district. He is a native of the valley of Cashmere; and as will be evident from the Photograph, his features are of the highest class of Aryan charecter - identical, in fact, with the European; and the difference between them, and those of other Brahmins represented in this work, will be at once evident on comparison. Pundit Jowalla Natli is a person of essentially European mind. He has mastered the English language, which he both writes and speaks with a fluency and correctness rarely attamed by a foreigner ; and his honorary title of Pundit could only be assumed upon a high standard of proficiency in the Sanscrit literature of his own country. which the Pundit belongs, are increasing in numbers and in influence ; but they can do little as yet, perhaps, to affect the ignorance and bigotry of their countrymen. " 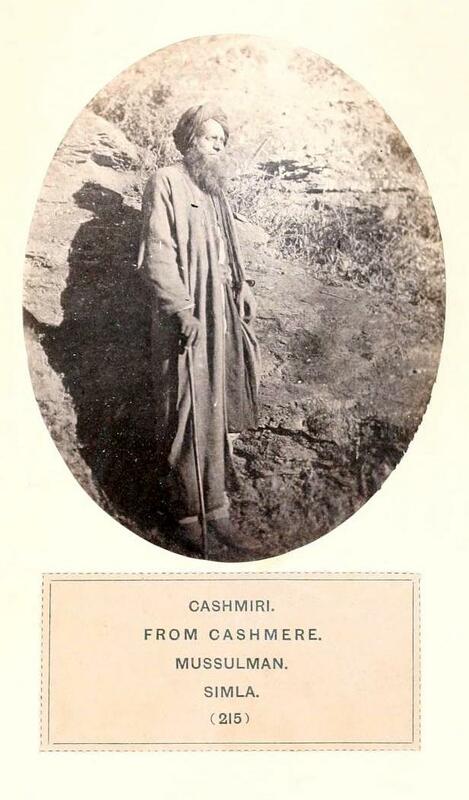 Cashmiri From Cashmere. Mussulman. Simla. "MAHOMEDAN merchants from Cashmere are very commonly met -with at Simla, and, indeed, in all the northern stations of India. They bring shawls, scarves, embroidered cloths, and other local manufactures for sale, as well as dried fruits, which are readily disposed of. The costume of the Cashmiris differs from that of ordinary Mahomedans of India. 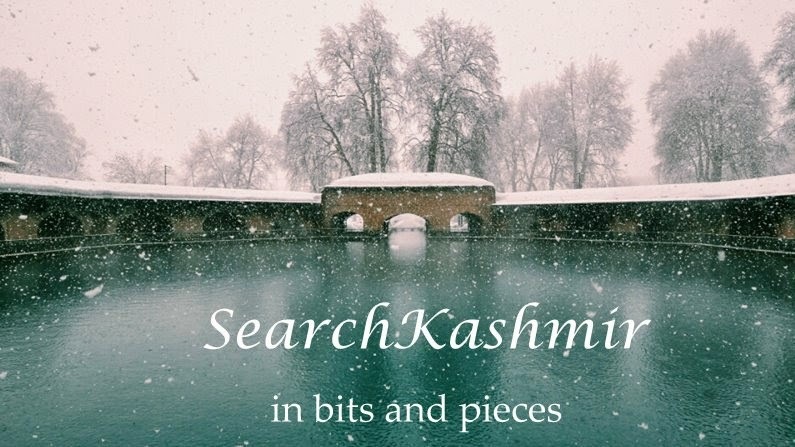 Instead of the tight and often ungraceful tunic, the garment shown in the Photograph, which is called chogha, is almost universally worn, especially in winter. The best are made of soft serge, or cloth, woven from the fine wool of the shawl goat, and the natural colours, brown, grey, or white, are preserved. These garments are frequently handsomely embroidered on the chest and shoulders, as also down the back, by silk or woollen braid in remarkably chaste patterns; and there is no class of Cashmere manufacture, perhaps, which more perfectly exhibits the exquisite taste of the artizans of the country, than these embroideries. They are never in varied colours, and the best effects are produced by braids in monotone, crimson upon white, dark grey upon light grey, and other combinations. These manufactures, both in shawls, scarves, cloaks, and even choghas, are now becoming known in Europe, and are to be found for sale in the shops of London and Paris shawl merchants; while in the beautiful collections of the India Museum, many specimens of the finest descriptions of work can be examined by those interested in Indian productions. The Mahomedans of Cashmere are in no wise different from their brethren of Northern India. They are, for the most part, Soonnies, and have a strong admixture of Aftghan blood; but, as a rule, they are not a military class, nor have they ever been remarkable for the military spirit so abundantly displayed by Mahomedans elsewhere. They are, however, a fine, handsome race of people, and their women, who have not unfrequently fair, ruddy complexions, are esteemed very beautiful — the Circassians, as it were, of India. 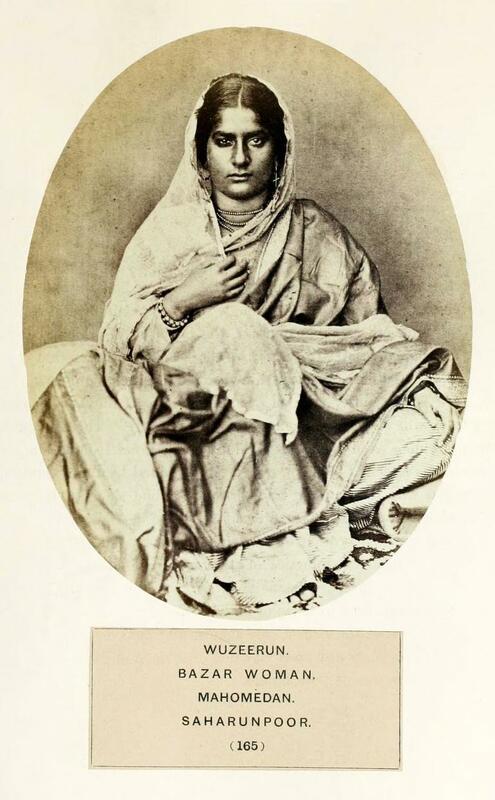 Since the sale of Cashmere to Golab Sing, the Rajah of Jummoo, by Sh H. Hardinge, in 1846, the oppressive character of the local administration has induced many of the shawl weavers and embroiderers to leave their native country, and settle in the northern cities of India ; and in most of them, colonies of native Cashmiris have been established, which subsist upon the manufacture of articles in local estimation; but the shawls have not the softness or beauty of those produced in Cashmere, and the best articles produced are perhaps the embroidered shawls, scarves, and choghas, before alluded to. Cashmere was originally an independent Mahomedan kmgdom, but was conquered and attached to the imperial dommions by the Emperor Akbur in 1587, and was used by him and by his successors as a place of retreat from the summer heats of India. It passed from the Mahomedan rule to that of the Sikhs in 1818, and remained in then- possession till its sale to the Rajahs of Jummoo. Could the entire possession of the Punjab have been foreseen, it is not improbable that the beautiful valley might now have been a British province. " "Diljan, the "heart of life," is like Wuzeerun, a Mahomedan courtezan. Her dress is black tunic, black silk trowsers, and Cashmere shawl." Wuzeerun. Bazar woman. Mahomedan. Saharunpoor. it may be disguised, prevents any open violation of them, and the customs formerly existent can hardly now escape punishment. "